The year of 2016 has kicked off with a good start, at least when it comes to variety of street artistry and murals! If the rest of the year could be judged by the great pieces made in the month of January, then we’re in for a very exciting and prolific year ahead. Basketball courts, doorways, sidewalls, roofs, containers, and almost every other urban surface imaginable have been adorned with some epic street art in the past four weeks. Selected from our Instagram wall, these 10 street art pieces were the most liked by the Widewalls community in the past month. You’ll be sure to find some of your favorite pieces in our regular Street Update section, but here we present the top ten murals and street artworks as voted by our Instagram followers. So, enjoy the best from the month of January! 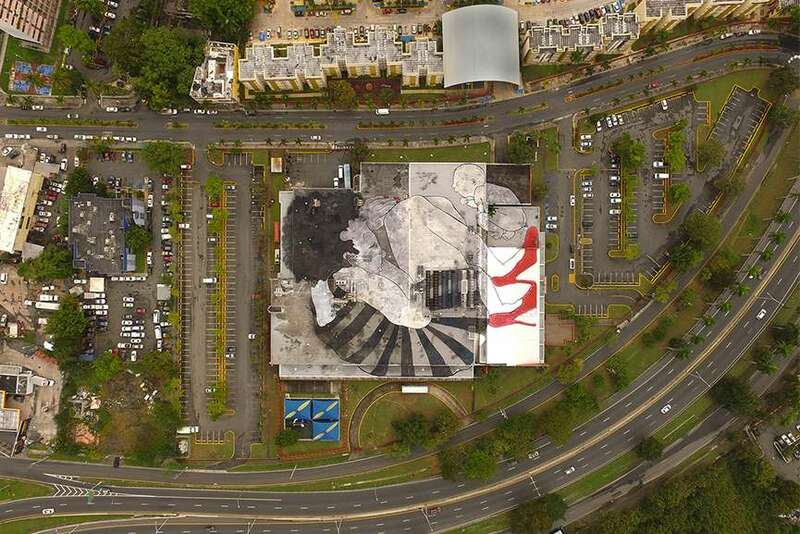 9,200 square meters is the size of this gargantuan piece on the roof of the San Juan Hospital in Puerto Rico (Centro Más Salud Dr. Gualberto Rabell). 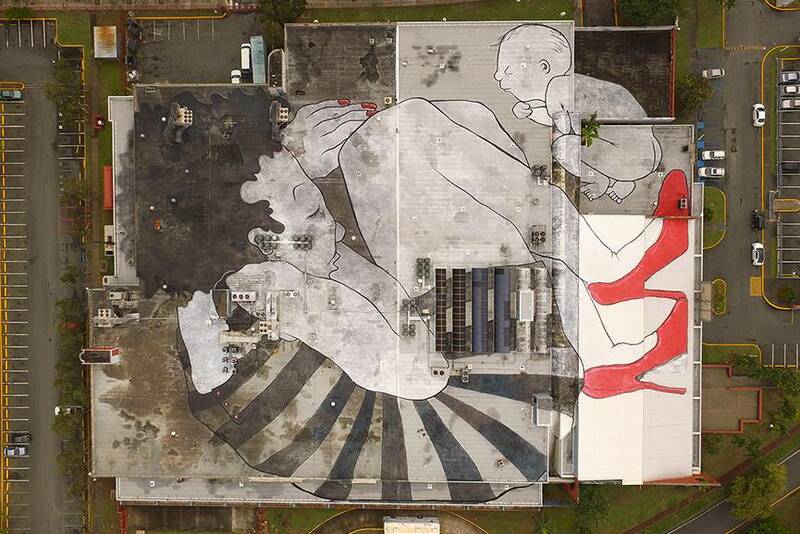 Ella & Pitr, the famous street art duo, painted this giant artwork named Cloudie Lopez & son fils Lidi as part of the urban art festival Santurce Es Ley. After four days of hard work in the heat of the Caribbean’s stormy weather, the duo produced this breathtaking, gigantic piece featuring a serene depiction of a mother and child, sleeping calmly. Interestingly, the security guards were not informed of the artists’ endeavor, so Ella & Pitr got stuck on the roof once and had to spend the night there. Surely, their slumber was not as serene as the giants’ one. 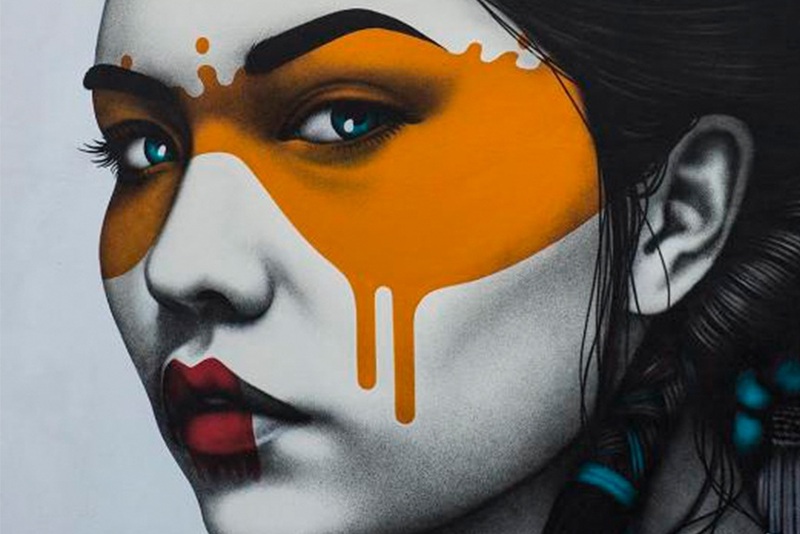 While on his tour down under, Fin DAC is hopping from city to city and leaving his mark as part of an artistic journey. Recently, the Irish muralist spent a number of days painting this beautiful piece in Adelaide. The artwork was created as part of the Little Rundle Street Project in the Kent Town district, and it was inspired by one of his most popular muses: Menghna Lall. His signature style mixes both Asian and English Victoriana elements into a single form of imagery. 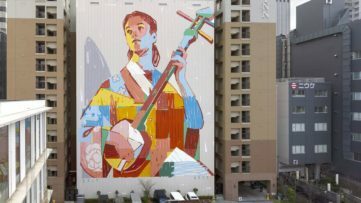 The mural is entitled Shinka, which stands for evolution or progress in Japanese. 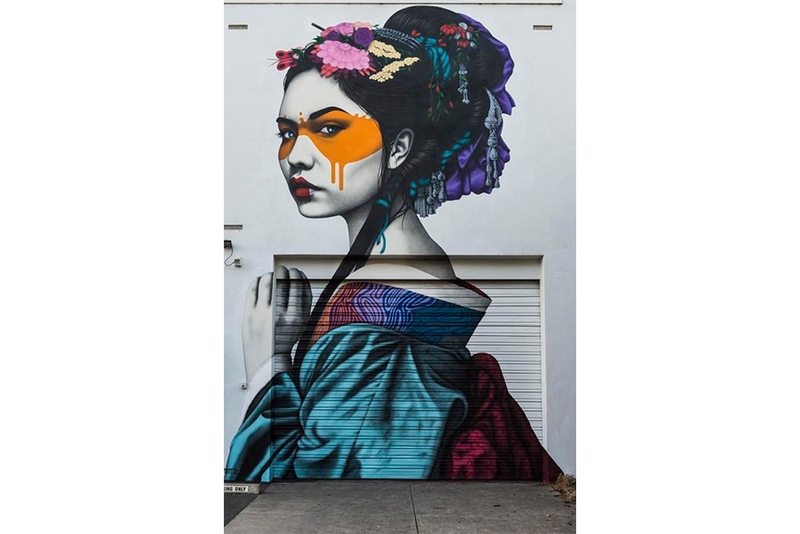 Don’t know how much further Fin DAC could evolve his skills, but this amazing piece already displays an astonishing amount of talent, artistry and expertise. Some of Jayn’s best works include intricate representations of animals, and this awesome snail is the latest addition to his oeuvre. The German designer, airbrush and graffiti artist finally found some free time and created this insane piece in Lüneburg, Germany. 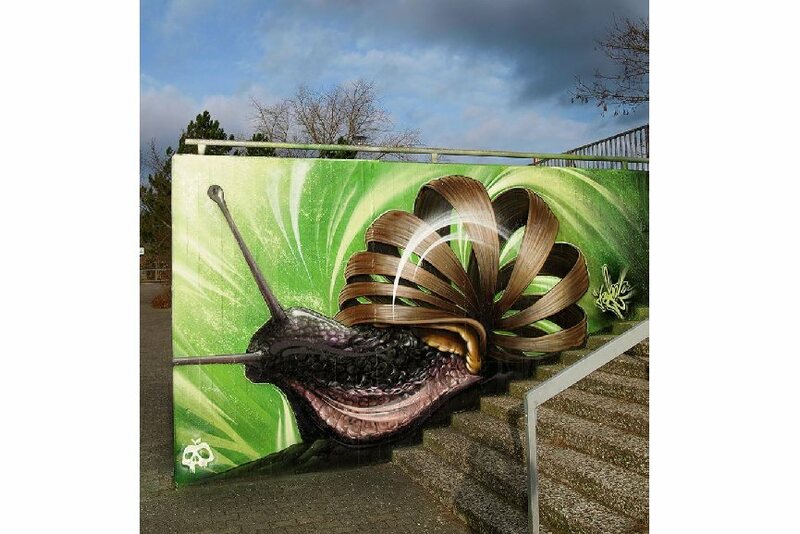 The fluorescent green background gives the snail a sort of a 3D motion effect, and the shell is done in the artist’s signature style, making the piece undeniably a work of JAYN. Having created his work in cities of Sao Paolo, New Delhi and other places across Europe, Serbian street artist Artez went back to his homeland. After 3 days of work in the rain, the giant mural in Novi Pazar was finally completed. 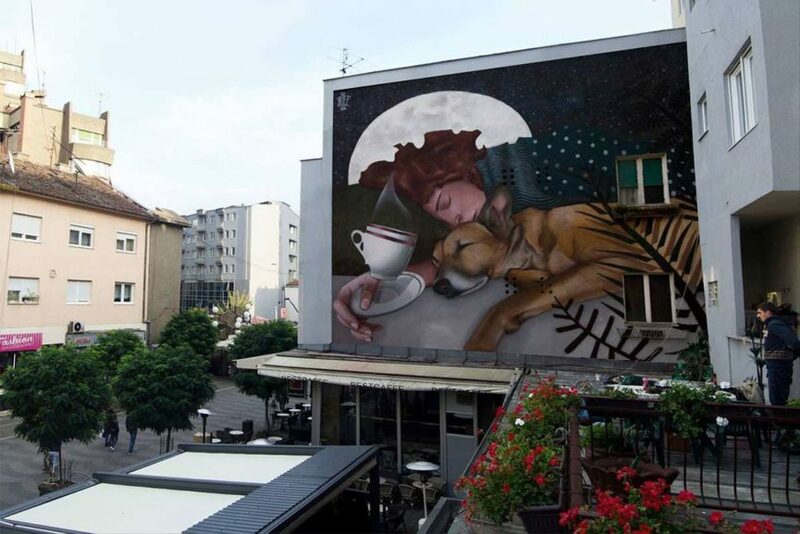 Dubbed Time to wake up, the large-scale piece features a sleeping girl and a dog, with a cup of coffee floating away into a silent dream. 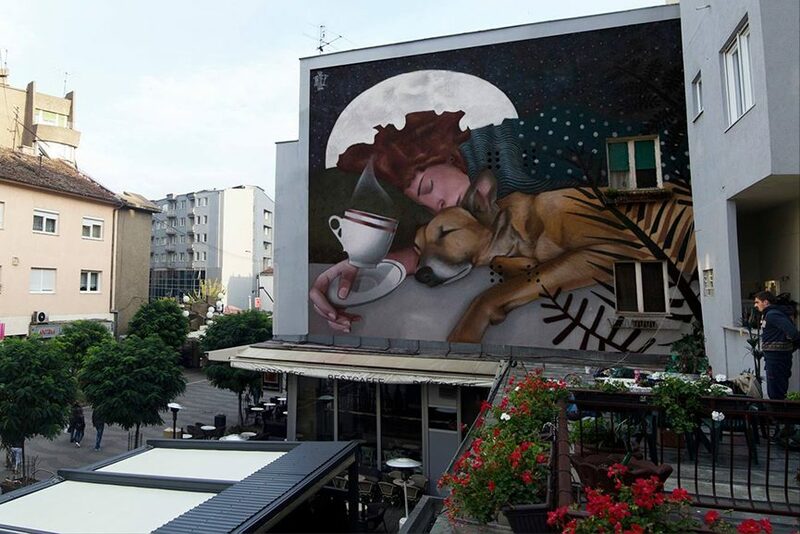 At first, the mural was planned to be one of the few to embellish the walls of Novi Pazar, however, the whole project quickly blew up and inspired numerous other artists to come forth and express their creativity in the form of street art. Undoubtedly, there can never be too many murals and great works of street art. 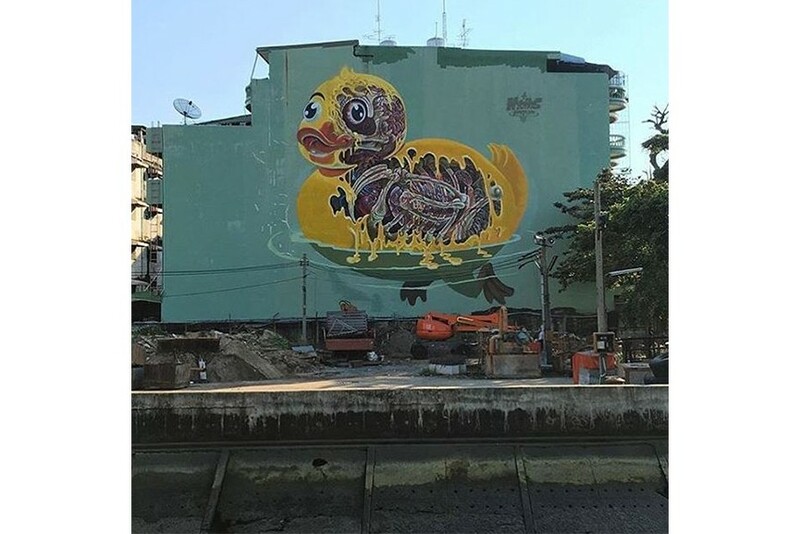 The prominent Austrian street artist, Nychos produced this somewhat unnerving image of a rubber duck, literally having a meltdown. Made for the Bukruk II Urban Arts Festival, the mural is named Rubber ducky meltdown, and it displays the artist’s signature style of outstanding technical prowess. Nychos’ fascination with dead animals is still a pervasive theme in his art, and with each new piece he continues to delve deeper into the dissected constitution of the creatures, showcasing an immense level of skill and details. You wouldn’t want to find this rubber ducky in your bathtub now, would you? Christian Rebecchi & Pablo Togni make up the street art duo from Switzerland known as NEVERCREW. 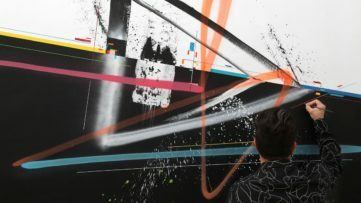 Creating in a variety of techniques, they include two-dimensional, three-dimensional works, paintings, sculptures and installations. 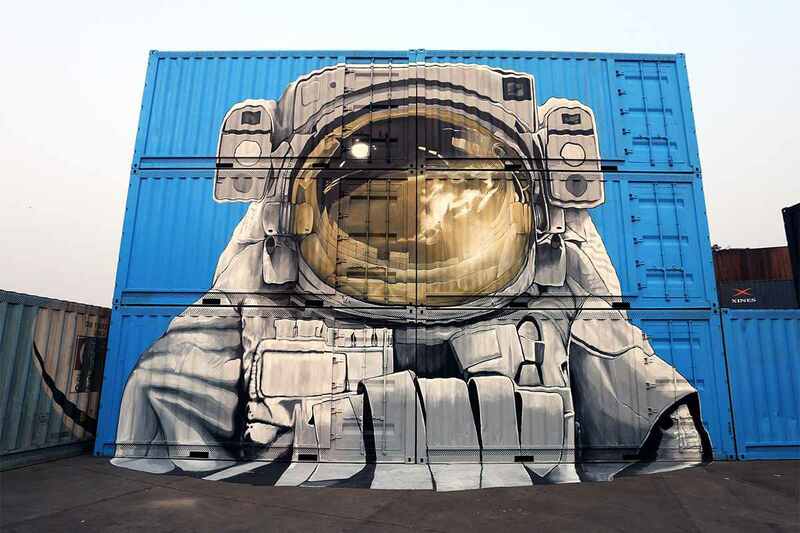 Made for St+Art India festival, this neat image of an astronaut took the duo a few days of work to finish. 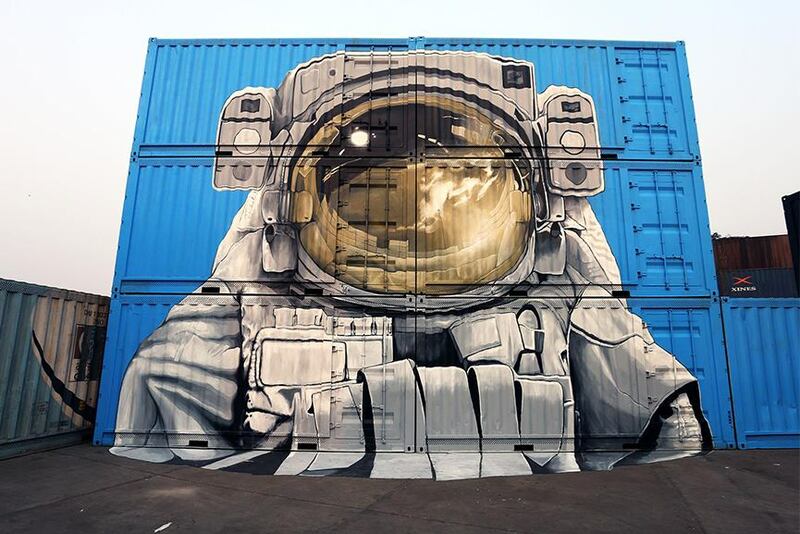 The details are incredible, the reflection of the astronaut’s helmet shows the actual surrounding containers and the landscape from the Concord Container Park, making it look like the figure is really there next to the viewer. The duo continued on to paint a piece in the district of Lodhi Colony, so we’re looking forward to seeing how the new artwork turns out! 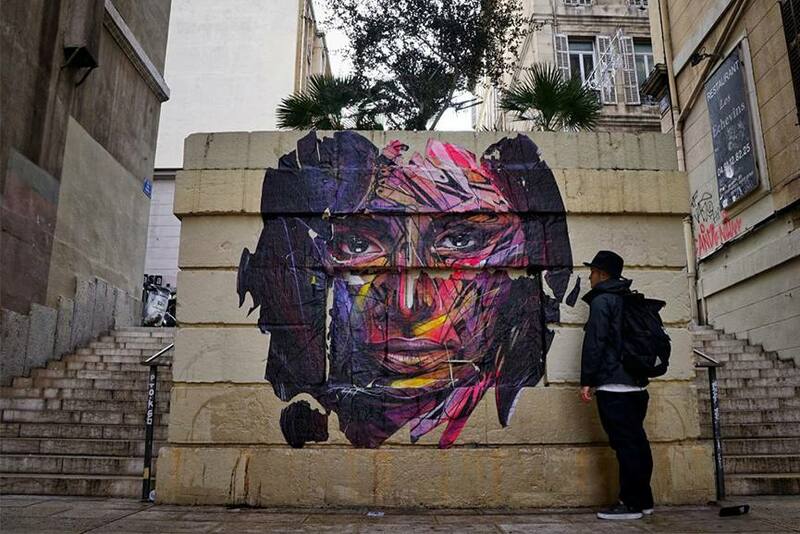 Now, here is a street artist with a very special and unique style who is on the rise in the urban scene. Bisser is an extremely talented Belgian who displays his unforgettable and highly-stylized approach both on paper and on walls, his murals have made quite an impression on the crowds as he made the top 3 at Bloop Festival, and he continues on to wow the crowds. His drawings, designs and t-shirts are selling like crazy, there is an underlined appeal to the very distinctive and original style in his art. 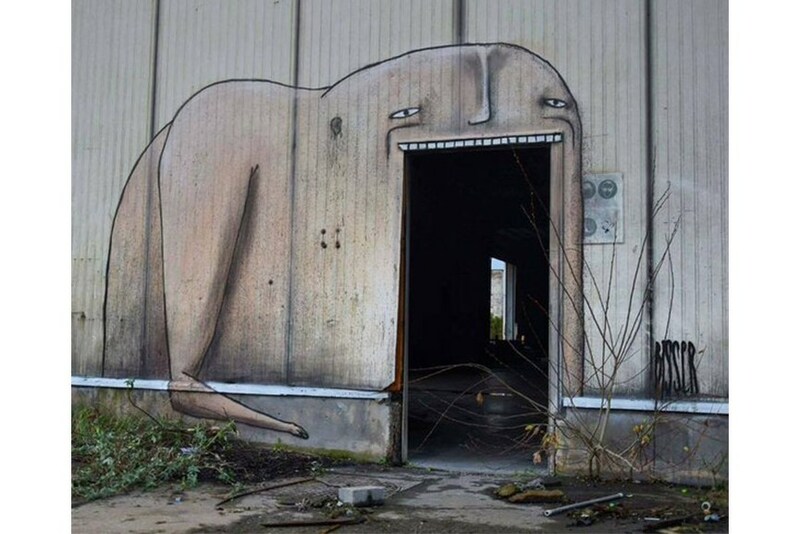 This particular piece was made near Leuven in Belgium, and it features a cleverly placed figure with a gaping mouth, which actually act as the door to the building. 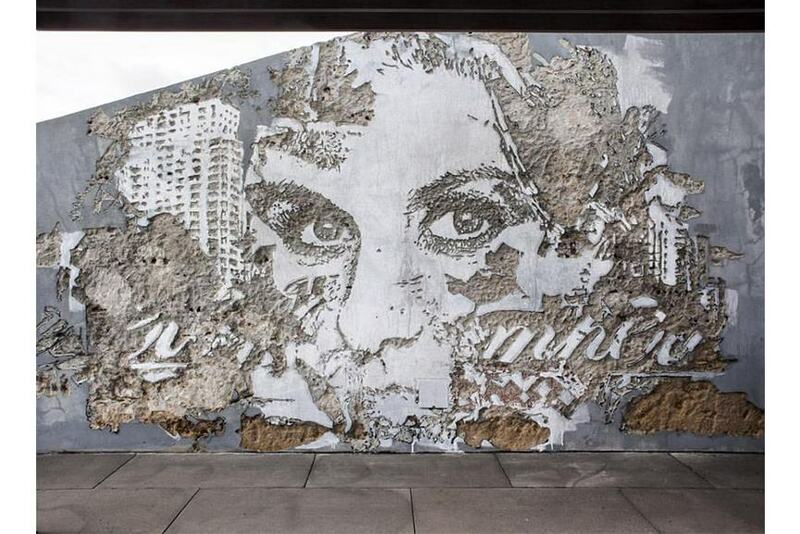 Oversized portraits carved directly into the outdoor walls or a decaying surface of a building, that’s the signature style of the Portuguese graffiti/street artist Vhils. 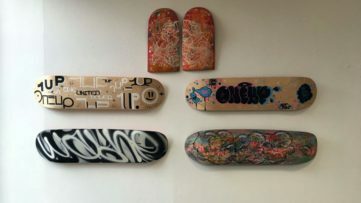 Even though his name is internationally recognized and his unique style has become his trademark, the artist still manages to keep some secrecy and mystery. One of the Vhil’s latest pieces depicts a female portrait with and a part of the urban backdrop behind her, while her eyes seem to be locked down onto the viewer. The artwork’s location is secret and remains unknown, but the prominent artist keeps us updated with his Instagram posts where he recently unveiled this beauty. You can always count on Alberonero to enliven and completely alter the dull and sometimes depressive street surroundings of the urban world around the globe. 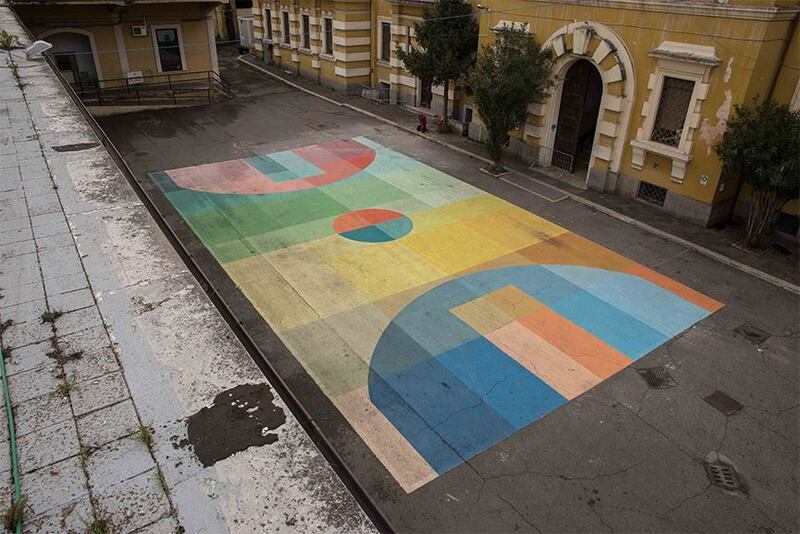 After traveling the world to create new works, the Italian artist came back to his homeland where he teamed up with Studio Volante to create this astonishing new street piece. 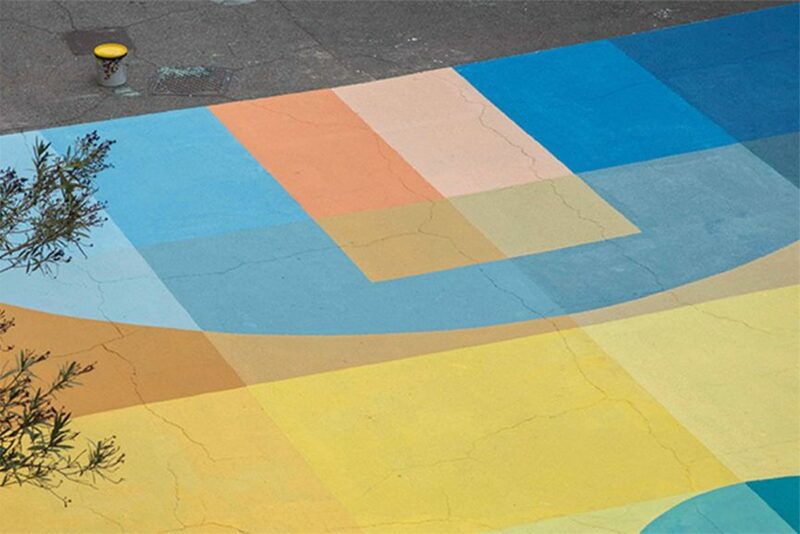 Using his signature abstract imagery with an abundance of colors, he remixed a class basket-ball court and gave it a completely different dimension. Judging by the community votes on our Instagram page, this was definitely your favorite piece from the month behind us.